This very special miniature commemorates the 100th anniversary of Norman Lindsay’s The Magic Pudding. 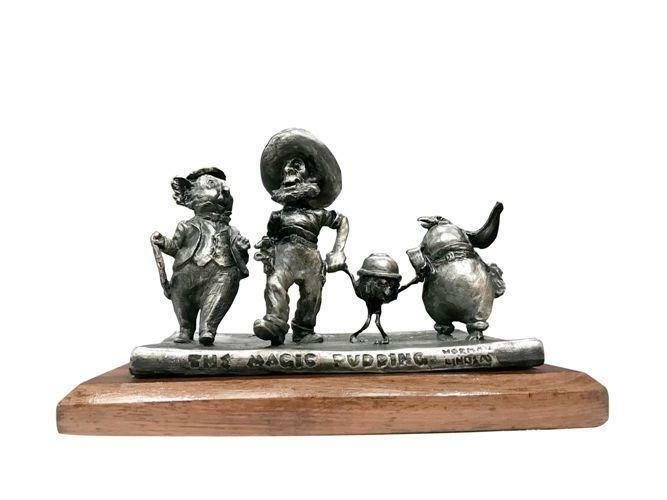 The bronze miniature is a replica of the Magic Pudding sculpture by Louis Laumen that is the centerpiece of The Ian Potter Foundation Children’s Garden at the Royal Botanic Gardens Melbourne. These extra special hand-crafted miniatures have been dated with a centenary stamp (1918 - 2018) and the book on which the characters stand is plated in burnished sterling silver instead of bronze. Only a limited number of anniversary miniatures of this sculpture have been authorised under copyright from Norman Lindsay’s family and are handmade to order by Fundere Fine Art Foundry. There are only 18 available world-wide.